Materials: Any kind of Stainless Steel. Will prep all other Steels also. Note: The PMM200SS is designed to work on Stainless Steel with its new Powerful slow speed motor, the PMM200SS also has guide Plate with guide rolls made of Stainless Steel, the PMM200SS is easy to use, portable, heavy duty machine designed for bevelling Steel / Stainless Steel plates prior to welding. This bevelling machine features a new single milling head equipped with 10 square, indexable inserts makes machining process far more efficient and much less operator fatiguing smooth operation and exceptional efficiency. Capable of bevelling around 1.5 meters/minute (depending on the amount of the metal being removed). 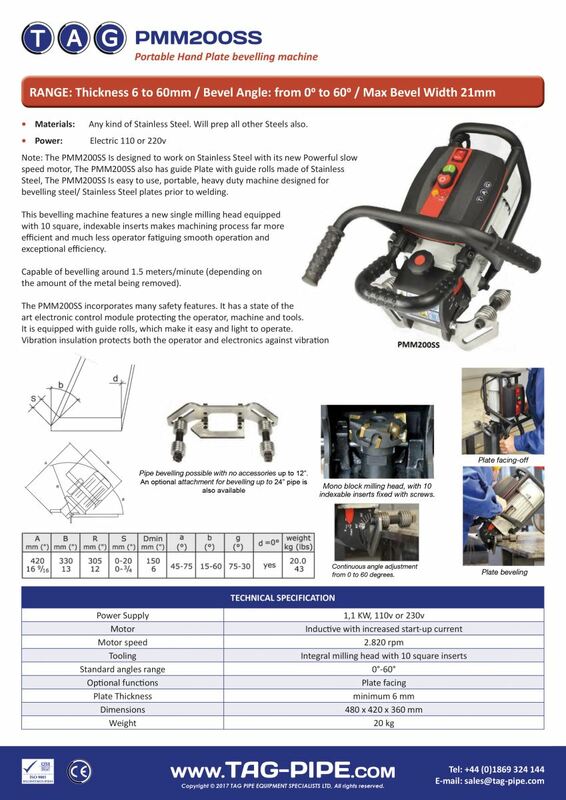 The PMM200SS incorporates many safety features. It has a state of the art electronic control module protecting the operator, machine and tools. It is equipped with guide rolls, which make it easy and light to operate. Vibration insulation protects both the operator and electronics against vibration.